Earlier this week, Microsoft started sending out developer-only test units built by Samsung and LG to developers to help them test the performance of their upcoming apps on actual handsets rather than emulators. Folks at NewsGeek site has put this test phone which is running Technical Preview version of Windows Phone 7 against iPhone 3GS running iOS 4 for a head-to-head web browser speed comparison. Unfortunately, since the test was conducted on a (different?) 3G network instead of WiFi (see the Disclaimer below), In all fairness, it will be unfair to pick one winner between Mobile Safari and Mobile IE. Disclaimer: this video was made as a part of a "first view" article that we wrote on windows phone 7. In that article﻿ we specifically mentioned that this test was taken using 3G and not WiFi, so some of the gap between the phones can be explained due to connectivity issues. putting that a side, we can also say that iPhone 3gs is a finished product while the windows 7 based Samsung device that we test is a developer phone we an OS that is still in development. Also since this Samsung test unit is running an unfinished version of OS on a prototype hardware, we can expect it to perform better when it is finally released this fall. Sites like Engadget and Gizmodo have already found Mobile IE surprisingly “a really pleasant experience” than what they thought it would be. Loading the desktop version of Engadget was just a hair slower than an iPhone 4, and just as importantly, rendering new parts of the page as you scroll is plenty fast — not instantaneous, but fast enough so that you never find yourself consciously waiting for it to catch up. Internet Explorer is surprisingly competent, and quick, given that it’s built mostly off of the desktop version of IE7. Most of the sites I went to, from Gizmodo to the Atlantic, loaded without any problems, just like you’d expect them to. Only a hair slower than iPhone 4? not bad for a browser and OS which is still in Beta. Now if only we could see it in action on video.. that would be great ! great comparison … but i think it should used the same browser to head-to-head..
looks a lot slower to me and I don't think the design is very attractive. iPhone 4 is a million times better and the scrolling is just terrible looking on that windows 7 gadget. No sir, I don't like it! Sorry but no! As one can see, the winner if Safari mobile… from far. Sure, IE mobile for W7 is still under construction but, should it be stable, I suspect it will keep being an MS creature… without grace nor efficiency. People and the enterprises as well are more and more keeping them off and that's the best thing to have a fruitful competition. It looks like two phones have different connection speeds. No matter how bad IE, apparently it just does not get response from website as fast as iPhone. I wonder what network is used for this “preview” model of Samsung. Anybody knows? Beta should not affect browser speed. WebKit, Firefox, Chromium, and Opera nightlies are not inferior to a stable version. That's not an excuse for speed. 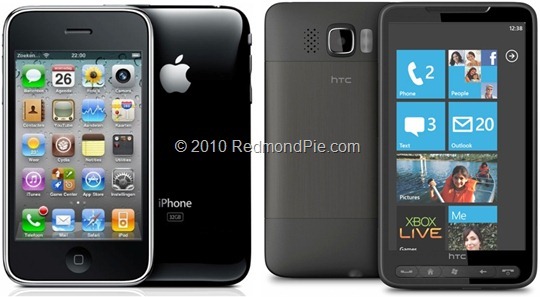 Why not iphone 4 vs WinPho7?? ?